The Congressional Budget Office released its analysis of the tax overhaul Senate Republicans hope to pass this week, and like a previous analysis by the Joint Committee on Taxation (JCT), it found that the bill would increase the federal deficit by about $1.4 trillion over 10 years. The CBO also found that, compared to the JCT estimate, the bill would be worse for Americans earning less than $75,000, factoring in the changes to Medicaid, Medicare, and other health-related programs as well as zeroing out the Affordable Care Act individual mandate. Under the CBO analysis, Americans earning up to $30,000 a year would be worse off by 2019, those earning $40,000 or less would take a hit by 2021, and Americans earning $75,000 or less would be worse off by 2027. The amounts in the table are in millions: The table is saying, that people earning under $10,000 lose $8.7 billion as a group in 2025 under the bill, whereas people earning $1 million or more gain $15.8 billion as a group. It doesn’t tell us how much a typical family earning under $10,000 would lose, or how much a typical millionaire would gain, or which groups gain or lose more or less per person. The table leaves out some factors that would make the Senate bill look worse. For instance, it doesn’t include the costs to upper-middle-class people who buy individual health insurance without a subsidy. Those people would face much higher premiums, because the individual mandate’s repeal would push healthy people off the insurance rolls. Because that change doesn’t affect federal spending, it doesn’t show up on the CBO ledger. The CBO also doesn’t attempt to estimate the effect of slashing the estate tax, a change that exclusively helps the ultrarich. Now do some reasearch on how long that will last i.e. how many years. Hint... try to compare in say 8 years from now. what's being predicted for 8 years from now? nobody can predict what's going to happen 8 years from now. Yes they can. It's in the tax plan. That's why it's called a plan. If it passes, it becomes law, and very predictable.. Read my last post. Most prognostication is both imperfect and biased. CBO is just imperfect, but more perfect than most. This analysis of their their two and six year revenue forecasting details shows that are usually a bit optimistic on revenue. This analysis shows their forecast on the ACA. Was it dead on accurate? Nope. But they were as accurate as anyone could possibly ask for. We are talking about predicting the spending and health habits of 56 million people. Also judicial decisions, new legislation, and administrative actions caused significant changes in the costs of the ACA’s insurance coverage provisions. The CBO's Crystal Ball: How Well Did It Forecast the Effects of the Affordable Care Act? If you have another 10 year analysis of this tax plan that you think is better, I'd like to see it. looks like more fuzzy math regarding the ACA. it's a trigger button the MSM likes to push. So it's hard for you to understand simple predictive math? Now which bracket do you fall under, and what happens in 2025 aka "8 years from now"? didn't Obama get to sell the bill pointing to the CBO saying it will cut premiums? Looks like it stays about the same. And you can keep your own doctor. That's why it's called a plan. Putting a neat little graph together doesn't make the numbers any more real. It’s worth noting one detail in the CBO analysis. The amount that the government will save by not subsidizing health-care costs for those earning less than $40,000 between now and 2025 is about $94.4 billion. Over that period, the government will be giving up an almost equivalent amount — about $91.7 billion — in tax cuts to those making at least $1 million a year. One has nothing to do with the other. But I guess they got their "trigger" point in there. Taking from the poor and giving to the rich. I'm surprised the article didn't include the "pay their fair share" line. My blue dot gets a little smaller. Good timing too because that's right about the time I'll be buying the business. So ....... are you saying the tax plan is fake (news)? If it's fake, why do you believe you are getting a 3-4% break? Based on the numbers they have laid out for next year, which is more believable than some predicted government screw job that might happen 8 years from now. And I don't believe anything the government tells me. If they make doing taxes a simpler task, I'm all for it. If I save some money in the process it's a bonus. Sorry to just notice this post. The rise in expenses doesn't quite track with a loosening of credit in the way you're painting in the vast majority of institutions. Below are some charts that demonstrate the decoupling of expenses at universities and aid. Here we see how costs track with federal grant monies. 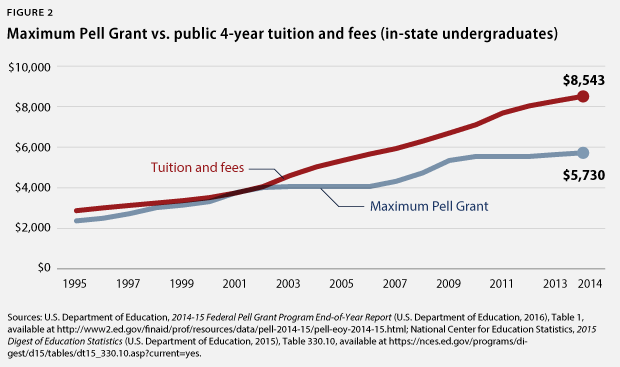 What you should be able to see from these charts is that price gouging is happening at the university level regardless of steady financial aid or in some cases decreases. I agree with you that it's largely business maneuvers and that there is an accompanying debt bubble, but the idea that government is playing an appreciable role in driving the spending and cost inflations simply isn't supported. but the idea that government is playing an appreciable role in driving the spending and cost inflations simply isn't supported. Agreed, the active role of price grabbing is solely done by colleges. 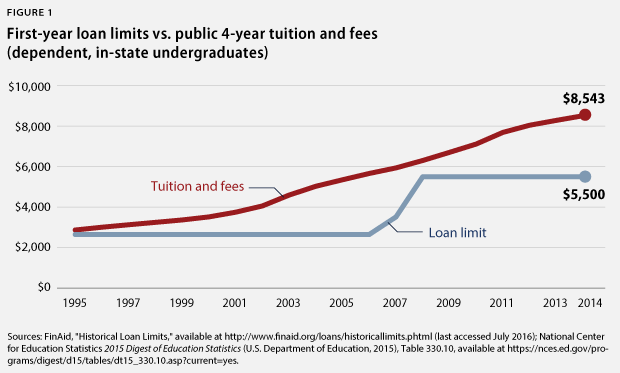 Financial aid by the government is merely abused, which creates the bubble. The state and local fundings went down from what seems the economic down turn, but now the schools were dependent on this money and doubled down to make up for the addiction. The graphs also show that the tutiotn more than tripled, and that in only two decades. It shows so clearly what madness we are dealing with.